What is my Temporary URL? Click the Account Technical Details button. What does my Temporary URL do? Your Temporary URL allows you to test your website if your domain name is not yet pointing to our servers. This is typical if you are transferring your website to InMotion Hosting. Your domain name will still point to your previous hosting provider while you're uploading and testing your website on our servers. Important! The Temporary URL and the Temporary cPanel URL's are not really temporary. They go to the same location as your regular cPanel and Web files. The difference between the temp and live site is how you access the files. You can access the server when your domain is not active or not pointing to your server with us. How do I test my website with the Temporary URL? Earlier in the article, we showed you how to log into AMP and find your Temporary URL. To test your website using the Temporary URL, simply visit that URL. You should see your website at this point. You'll want to click on various links in your site and ensure each page is loading. Do I point my domain name before building the site,? How to get web accessible ip address or url? I'm sorry to see that the temporary URL is not working as you expected. I recommend reviewing the existing content on the server to ensure the proper configuration to load your website. For instance, if you are using WordPress, then you would need to configure WordPress to use the temporary URL. If you are a customer of InMotion Hosting, you can always reach out to our Technical Support for further assistance with using your temporary URL. 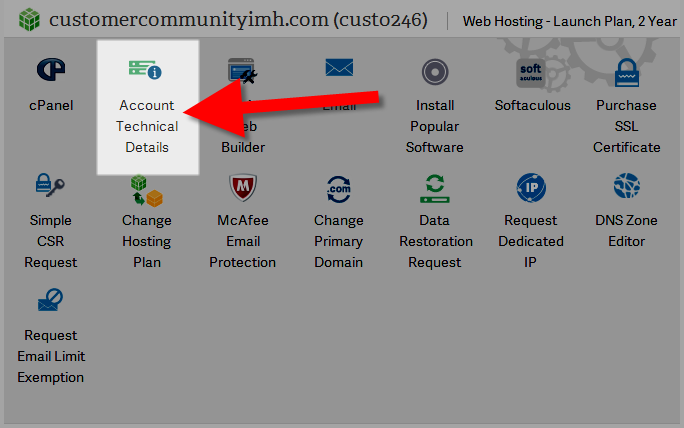 in cPanel temporary link is showing that not supported.. what can i do ? We are happy to help, but it is not clear what problems you are experiencing. Could you provide additional information and steps so we can help you troubleshoot further? The "temporary URL" just gives me a Worpress 404 error. Wayne, WordPress uses your site URL for loading certain parts of your page. 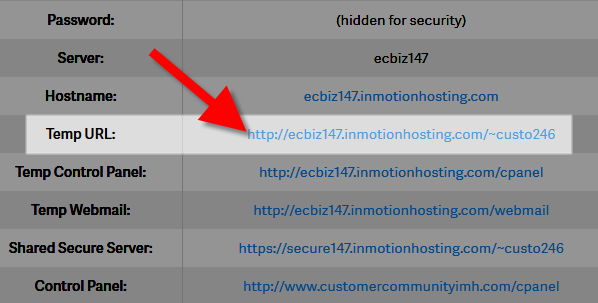 If you wish, you can <a href="http://www.inmotionhosting.com/support/edu/wordpress/wordpress-introduction/installing-wordpress-using-your-temporary-url">set your WordPress installation to use the temp. URL</a> instead of your domain name. Do I have a temporary URL for hosting my new customer before I point their DNS? For example I setup a new customer on my reseller account the other day and installed WordPress. I would like to login and test something before I point the DNS to it and be able to send the temporary URL to them for viewing before we point their DNS. Is this possible because I can't seem to find the temporary URL?Thanks! Thank you for contacting us. You can determine your customer's temp URL by viewing your main TEMP URL, then changing the Username at the end. You would replace the username (userna5) at the end, with the cPanel username for the account you want to access. What is the Temp URL if the addon is not in Public_html? We are migrating to InMotion.I have been building a new wordpress site on a temporary url (to replace an existing site) while the DNS still points to my old server. We are in the final stages and I want to make sure I do everythinh right. I am looking for step my step instructions for this process. Can you point me in the right direction? If you have made the changes described in the article already then you would just do the opposite when the DNS has been propagated. You would just to remove the two defines as described above. This shows the temp url for your main account. I have a reseller account and I'm looking for the temp url for the new accounts under my reseller account. Thank you for your question. You can determine your customer's temp URL by viewing your main TEMP URL, then changing the Username at the end. That is all fine but what about an addon domain? What if you addon a domain, install wordpress and want the temp URL for that? The AMP only shows the temp URL of the primary domain. The directory for the addon domain will follow the TEMP URL. Hello, how can I test a sub-domain on the temp url? Thank you for your question. Your temp URL resolves to your /public_html folder, so just add the folder name for the Addon domain, to the end of the temp URL. For more information on folder structure, see our guide here. I have developed a Wordpress site on WAMP and am almost ready to load it up to my account on an addon domain. The site I am replacing is on Weebly. Should I load the WP site to a temporary URL or use the modify host instructions you link to above? If I modify host files, what to I load the site onto?? I want to test the new site a bit on the server and make sure I match all the page URL's to the old one before I point the DNS to the new site. Advice? Thank you! As long as you have a hosting account somewhere, that is the one you will load the test site onto. Using either the temp URL or the hosts file mod is fine, it will not have any effect on your live site at Weebly. I personally recommend the hosts file mod as then you will not need to make any changes on the site before you go live. The only thing you will need to remember then is to undo the hosts file mod if you wish to view the live site at Weebly. The site cannot be published to the specified location. Cannot publish to the specified host via FTP. Authorization failed. Thank you for contacting us. An Authorization error in FTP usually means your username, or password is incorrect. I recommend checking them, you can view your FTP settings in cPanel. If you are using the Premium Web Builder, we have a guide on Troubleshooting Publishing with Premium Website Builder. Don't modify your Hosts file. Expand it (click on the + symbol) and select wp_options. In the area that appears on the right you'll see a table - the top two options are 'siteurl' and 'home'. Edit both so they read 99.999.999.99/~username. (don't use all 9's, use the IP of the machine you are hosted on (you can find it in your cPanel, in the column on the left by default. )(Use your username, not the word 'username.'). You can then login to your wordpress installation at 999.999.999.999/~username/wp-login.php and it will work fully functionally. I hope this helps some people. It sounds tricky at first but it's really easy. After regarding a new domain name and registering for hosting. I was given a temporary url to work with. After installing wordpress on the server, public html, I'm directed to wp and after clicking, I meet the plain html page of wp homepage. Is that ryt? What do I do? I'm not sure i follow what you are saying. Would it be possible for you to give us the link to the page you are talking about? Usually when working with a CMS you will want to modify your local hosts file instead of trying to use the website over the temporary URL. This way you can work directly with your site on the server as your develop it, without the DNS being updated to point the site live to the server yet. Or in your case, you would need to setup WordPress to work with Temporary URL so that the correct pages are loaded until you point the site live to the server. The downside of using a temporary URL, is that once you update your domain's DNS to point to the server, you have to go back anyway and configure things to work as if they were just running on the main domain. Do temporary URLS also exist for add-on domain websites? I would like to see the website before the domain is redirected to your server. Hello MB, and thank you for your question. Another alternative you have is to modify your hosts file to force your computer to resolve your addon domain directly to our server without having to point the live DNS to our server. Please let us know if you had any other questions at all! Hi when I am trying to preview my site through temporary URL it showing my website but a 404 error page. I don't know if it's good to share my temporary URL openly in a blog so I am not sharing it. Sorry to hear you're having some issues accessing your website over the temporary URL. In some cases if you're using a CMS like WordPress, Joomla, or Drupal, you'd be better of testing your site by modifying your hosts file on your local computer. Doing it this way, just your computer would access your website on our server, while the rest of the Internet would continue to go to your "live" website. Then you wouldn't need to worry about modifying your site URL setting in your software, which typically is what causes this 404 page not found error to happen. You also wouldn't have to worry about adjusting it back to the normal domain version after pointing your domains DNS to our server. Let us know if you were still having any issues at all getting it to work. I tried the modifying hosts file method, but after editing the host file I couldn't save it. With Notepad++ it shows "check if your file is opened in another program"
With Notepad it shows " You don't have enough permission to save file in this directory"
What the heck is going on with my pc ? Any solution from your side ? Ops it's fine now, I found the reason for this error. Thank you for letting us know. Would you mind sharing your solution for other people who may see this post? The temp link works for the home page but subsequent requests return to the original domain... think this is due to WordPress storing the original domain for all links in it's database as opposed to all links being relative? This tutorial is excellent! mostly about changing host file and browse domain without change DNS and restore site before it really effect for everyone. I love this idea, so the website will not face any downtime or maintenance mode. Thanks man! is it possible to have a temporary URL for an add-on domain? I'm moving in several add-on domains and I'd like to be able to view them before I change the DNS to InMotion, to make sure all is okay. I hope that helps to explain it. If you have any further questions or comments, please let us know. I have an add-on domain but it's not in the PULIC_HTML directory. It's in its own directory. What would be the temporary URL for an add-on domain that's in its own directory? Unfortunately, you will not be able to use the temporary URL to access other domains if they are not contained within the public_html directory.